And dang, it enticed me to go online and place a big order last night! I ordered these pj’s, this yoga tee, and this blanket in the midnight/camel. I’m super excited about that one! We got the stone/cream one last year and have used it every.single.day since all year long! I’m going to keep one upstairs and one downstairs now. Speaking of home decor, our reversible kitchen rugs are in the sale too! I get asked about those a lot and we’re very happy with them. They are soft on your feet and machine washable. We’ve had them a few years and they’re still doing great- they come in a rainbow of colors, we have the ‘Indigo’. I’ll continue reviewing the Sale throughout the duration, so please subscribe to get my blog posts delivered straight to your inbox! And I haven’t forgotten about those of you not shopping the Nordstrom Sale yet. At the bottom on today’s post, I have all the Weekend Steals to check out from retailers other than Nordstrom! Yesterday we had Dressing Room Part 1 with my initial favorites and the things that will sell out the fastest. 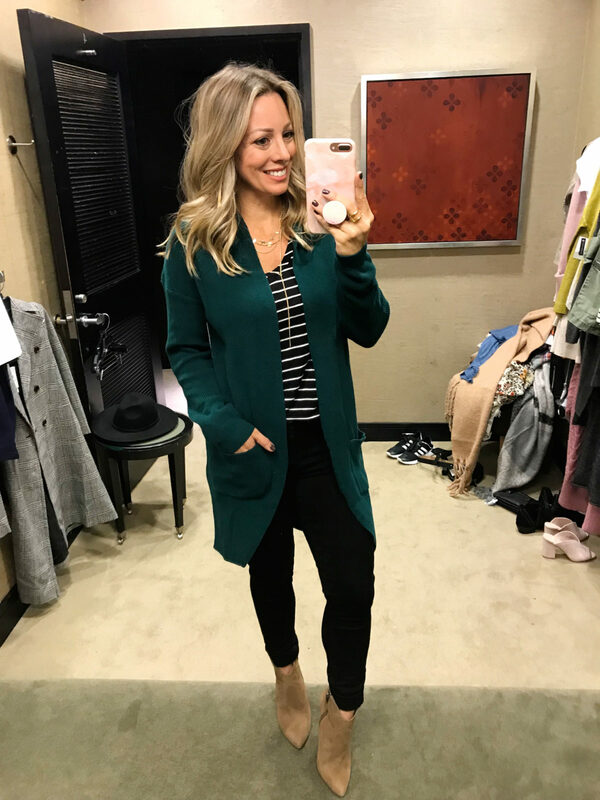 Today, I’m following up with Dressing Room Part 2 and focusing on the BEST cardigans and jackets in the sale and outfits to wear them with! For this post, I made an effort to be more succinct since I know there’s a lot. Let me know if you like this style. FIT : TTS, wearing US 2 and it’s meant to fit oversized. DETAILS : Long chunky knit goodness and the dusty rose color is gorgeous. You’ll want to cuddle up in this all day long. I especially like it with the tan knee high boots. DETAILS : This cardigan is super soft with an inner tie that you can cinch closed or wear open. It comes in 5 colors and the Oatmeal and Pink Cedar are particularly pretty. 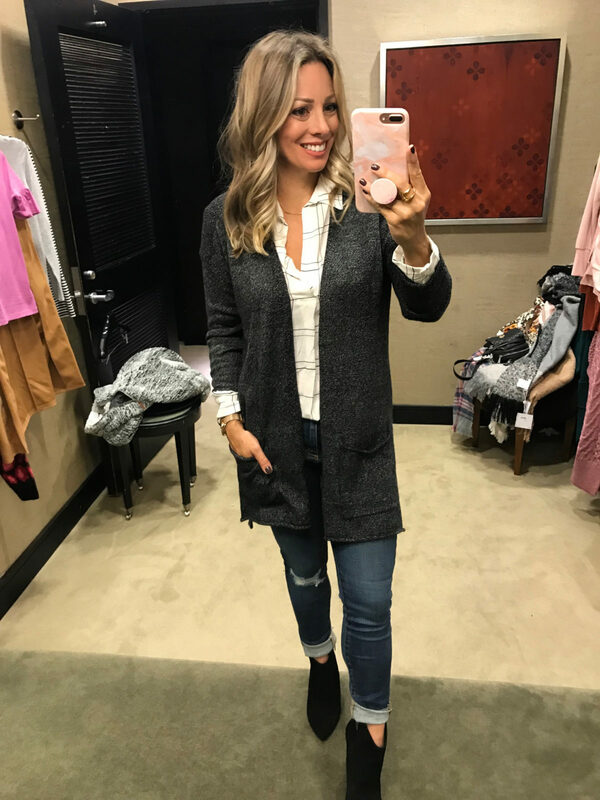 DETAILS: This relaxed fitting cardigan is a steal at only $31! It has slouchy drop shoulders and a curved hem. There’s 6 Fall colors to choose from. I’m wearing it with black jeans and blue denim in the two photos below to show you a few options. DETAILS : I dig the exaggerated balloon style sleeves on this soft knit cardigan. I’m wearing the ‘Brown Taupe’ that has a hint of dusty rose to it. I think the ‘Yellow Spruce’ will also be a great color for Fall, almost like a mustard yellow. DETAILS : I’m always drawn to pink, so of course I loved this one. It’s also particularly soft in a plush knit due to the special yarns used in construction. DETAILS : Of course I love my Barefoot Dreams Cozy Cardigan so much that I wanted to try this hooded version. It’s as soft as cozy as the original, but with a boxier cut, as opposed to the circle hem. It’s still equally as good, and I definitely didn’t want to take it off. DETAILS : If you like a duster style cardigan, this collegiate inspired cardigan has your name on it. But, several of the colors are solid without the stripes on the sleeves, which takes away from the prepster vibe. 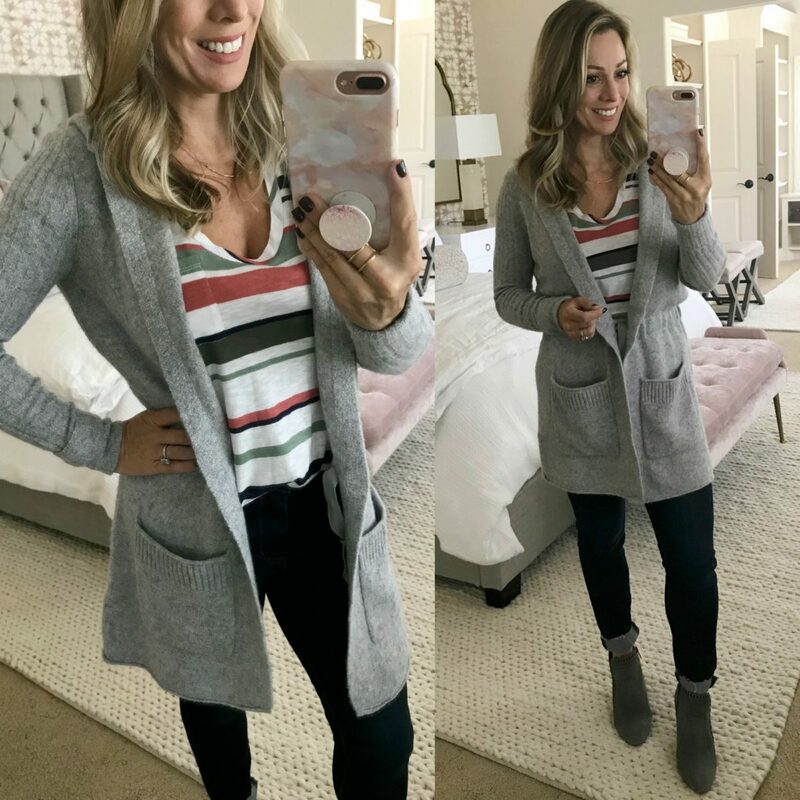 DETAILS : For those of you that are fans of shorter cardigans, this one is perfect as it hits at thigh level or higher if you’re taller. The marled cotton-blend is on the lightweight side, so great for in-between seasons. DETAILS : This jacket looks 100% better on than it does on the hanger. It’s so super soft and drapes beautifully in an effortlessly chic way. You can also fasten it at one side to wear it closed. It will look fantastic with leggings and boots this Fall and Winter. You won’t believe it, but you can machine wash this jacket! And it’s under $60! DETAILS : This year’s hot suede moto jacket by BLANKNYC is similar to last year’s, but sleeker because it doesn’t have the belt and beltloops. Whenever I put one of these hip jackets on, I instantly feel like a cool mom. I love the zip detail and rich color on this one! DETAILS : It’s got great details from the zipper on the sleeve to the quilting on the shoulder. It’s a crop length so it will make your legs look longer in jeans and skirts. But, I love pairing a leather jacket over a feminine dress for an unexpected twist. DETAILS : I love having a good jean jacket in my wardrobe because they are perfect for our generally mild weather. I often keep it in my car because then it’s always handy when I need it. This jacket has a lot of stretch with a released hem. If you want it more fitted (that’s my preference), I’d size down one. DETAILS : It’s more of a button down shirt fit with a pleat in the back and relaxed fit. It’s one of those pieces that’s versatile for throwing over a top when it’s chilly, but not downright cold. It also comes in camo! REALLY a fan of this one! I hope you can grab it before it sells out because you’ll get a ton of use out of it. DETAILS : Isn’t the camo version cute?! I like how they added that pink stitch detail above the pocket. I also prefer this jacket in petite. DETAILS : I really liked this coat on my friend Ali-Shaun, but I think it’s too overwhelming for a petite frame. On her it looked really sleek and stylish. The quality is really good, especially for under $60 and it looks and feels more expensive than it is. The ‘blue pearl’ is a nice silvery blue color. DETAILS : I’m a cozy junkie for sure and I really didn’t want to take this soft zip up jacket off. As much as I wear my Patagonia pullover, I think I’d get tons of use out of this jacket during chilly weather. This is the jacket that haunted me after I left the store without it, so I ordered it last night! Thankfully, it was still stocked in all sizes. DETAILS : When I worked in an office that often required professional dress, I was always on the lookout for chic suit options. This is a great workwear blazer with the classic houndstooth check pattern and smart fit. There’s a coordinating button front skirt that goes with it, or you could mix and match with black or grey pants or a skirt. 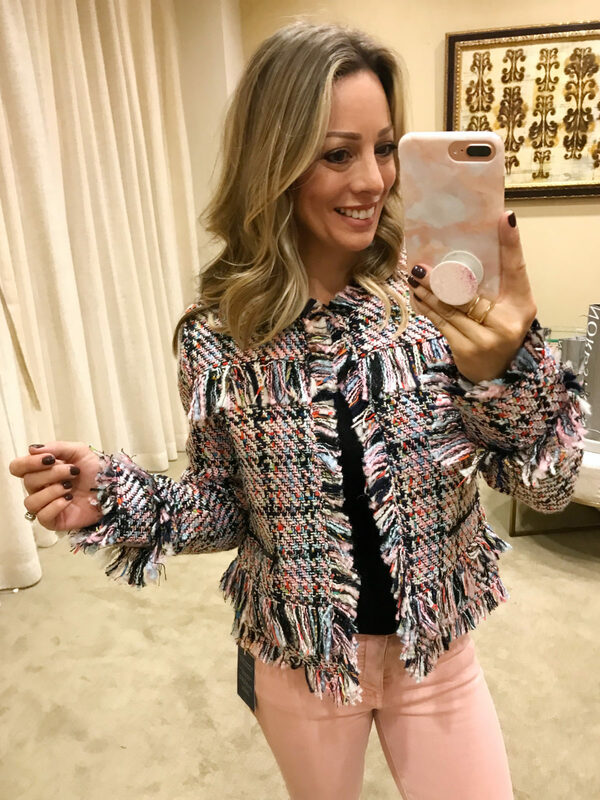 DETAILS : The colorful fringe on this classic tweed jacket makes it a beautiful combination of conservative and playful. It goes well with jeans for a classy night out look or more professional with pants and skirts. DETAILS : This pink blazer will be in style for years to come. It’s versatile for work to weekend and in between. At the office, it would look great with slacks and on date night, dress it up with skinny or bootcut jeans and heels. The cut is double breasted, but I like how it looks hanging open casually and with the sleeves rusched. 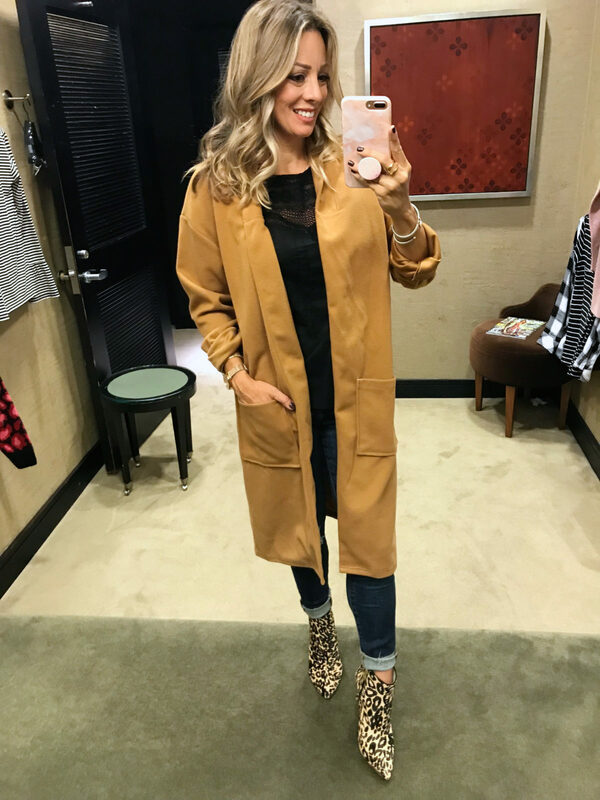 NORDSTROM • If you aren’t quite ready to shop for Fall or you don’t have a Nordstrom Card yet, there are still tons of clearance deals available! My picks: This tie front tee is under $15 and a cute ruffle and gingham swimsuit for those final summer vacations and this long sleeve magic dress is up to 40% off! My picks: There are some great new arrivals from Nordstrom favorites like : Halogen, Gibson & Vince Camuto. LOFT • 40% off sale styles! My picks: Shorts starting at $25. This lace cap sleeve tee is nice too! My picks: My red & white striped tank is $15 and the striped wrap top is on sale too!! My picks: My peplum tank comes in stripes and a few other colors and I love the comfort of this camo tee! My picks: This preppy peplum is darling and I love the casual feel of this blouse! My picks: Love the girly details on this tank and you know I love a V-Neck Tee. My picks: There are too many cute swimsuits too choose and I can’t quite give up the eyelet just yet! 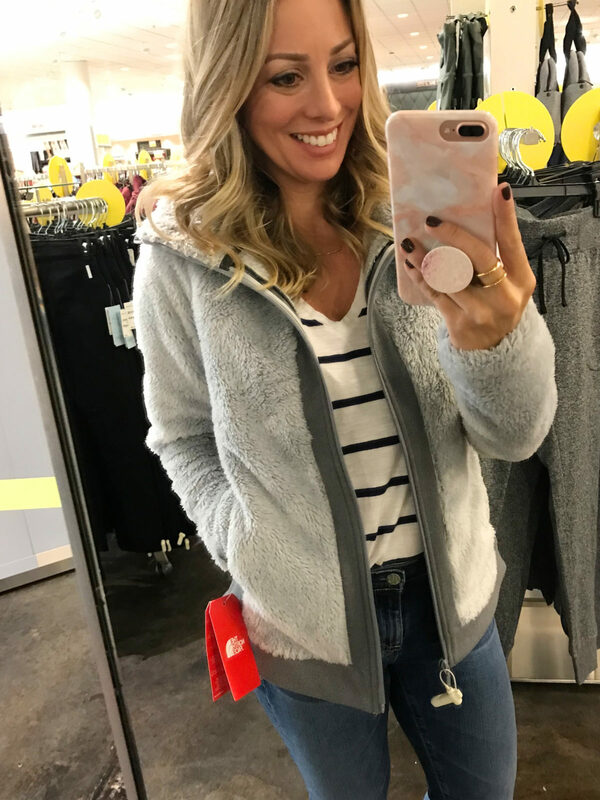 OLD NAVY• EPIC clearance event! 75% Off! My picks: This chambray shirt dress comes in two different washes and I’m crushing on this jumpsuit. My picks: This sunscreen mousse has been a lifesaver this summer! And I prefer a stick sunscreen like this for my face! I love that Blanknyc suede jacket! I have it in my cart , too. Love your try-ons! Thanks for all the great info. I already placed two orders but I just went back on and ordered the Barefoot Dreams cardigan! I had to try it, it looks so soft and cozy! 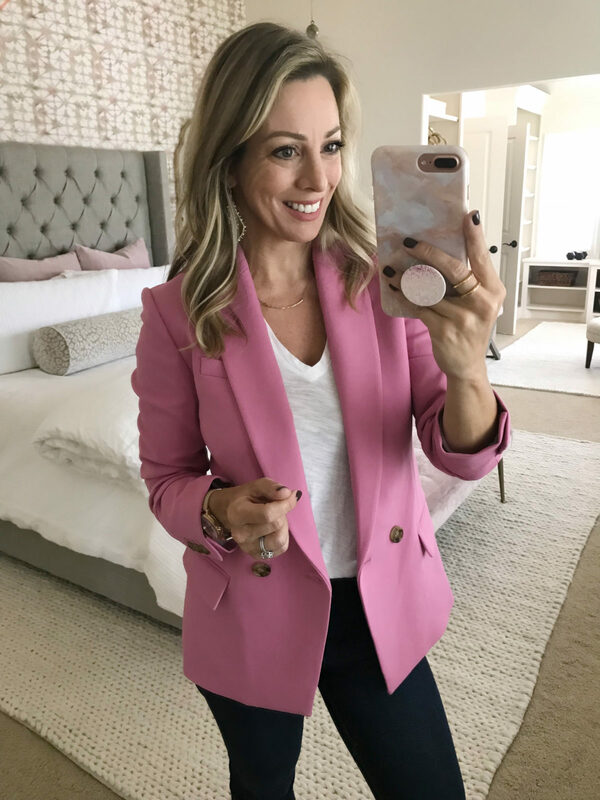 Love the pink J Crew blazer. I ordered that yesterday. So many cute options, Megan! I love that blazer also! Definitely a keeper! Thank you for doing all of that! I know you enjoy it, but it is also helpful to see it being modeled and hearing your comments. Nordstrum needs to know that there are others like me that find it too overwhelming and would just dismiss the sale, but because of your Nordstrum sale post last year and this, I’ve purchased items too. Wow! Let’s forward your message to them! And then hope that next year there are NO hiccups in the ordering process! Great pics from the sale and I like the way you put this post together! I just put that North Face fuzzy fleece in my cart and I purchased a big haul yesterday! I appreciate Nordstrom offering 10X points for every dollar spent, because yesterday was quite frustrating for a long while!! I agree! I was so disappointed to hear that so many of you had trouble! I had to place my own order twice! I’m glad they made it up with those 10x points! Oops, can you please delete my last name from my last comment? Was a mistake, thank you! So many great items! Love seeing items on you since I am 5’ tall. It’s so helpful! 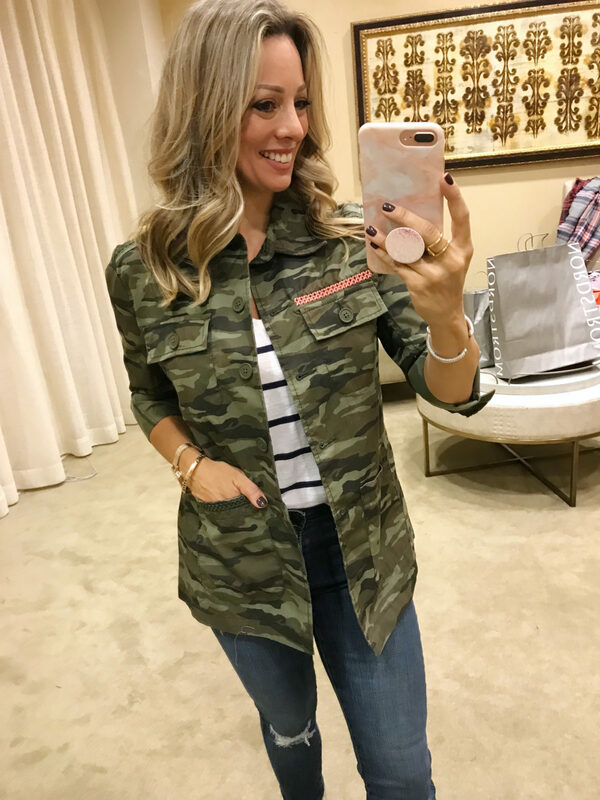 I have added that camo jacket to my cart, so cute and I love that it comes in petite! Thank you! I find the smallest things seem to go first, so I’m always trying to scoop them up before they sell out! 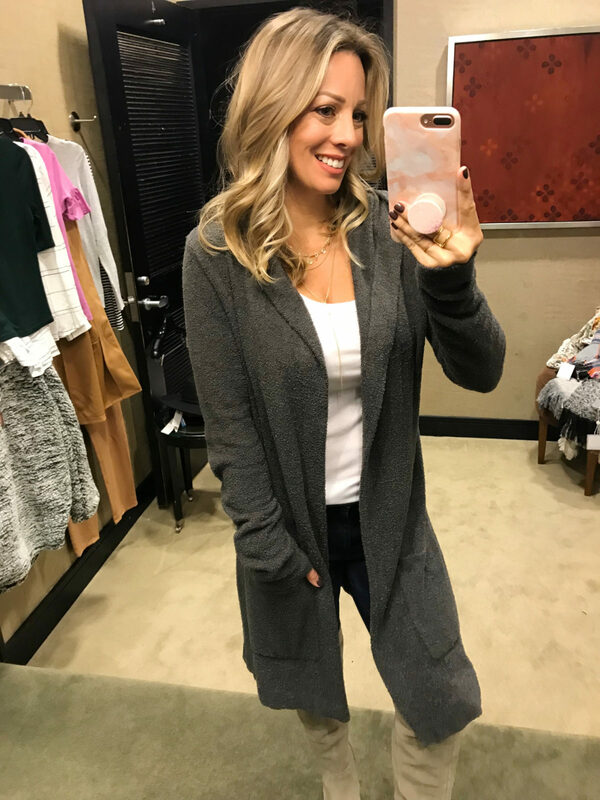 I definitely purchased a new Barefoot Dreams cardigan, I pretty much have to in each sale because I wear them so often during the Fall & Winter! 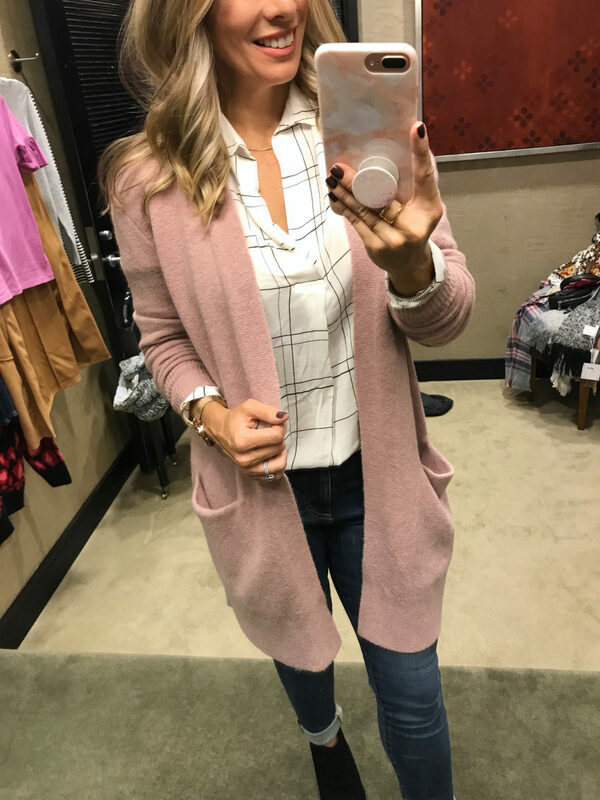 I also really love that first chunky long-line cardigan you featured, the rose pink color is so pretty and it looks so cozy! Hi! I think ours are 2×3 (keep one at the sink and one at the stove) and then a long runner 2.5 x 8. You really picked some awesome things. I ordered so many things from your links as soon as the sale started, but apparently my shipment is missing (even though I was at home the entire day) and most-wanted items are out of stock now. This has been the most frustrating and time-consuming on-line shopping experience and Nordstrom’s customer service has been terrible! All remaining orders have been cancelled and I’ll take my business to another retailer. Hopefully, you’ll share clothes from other retailers soon since you have such wonderful style!!!! Oh no! I absolutely hate that you had such a bad experience. I totally understand your frustration. I’m used to excellent customer service from Nordstrom, so this is extra disappointing. I hope they make it right for you. I will continue to explore more retailers in the future. Hope you have a great week! Hi Megan! I appreciate all the work you did for the NSale! I made several purchases based on your reviews. I am 5’2” and it’s really helpful to see how things fit on a smaller person! I love your blog, I access your content mostly through Instagram. Thanks so much for letting me know Jacki! I really appreciate that! 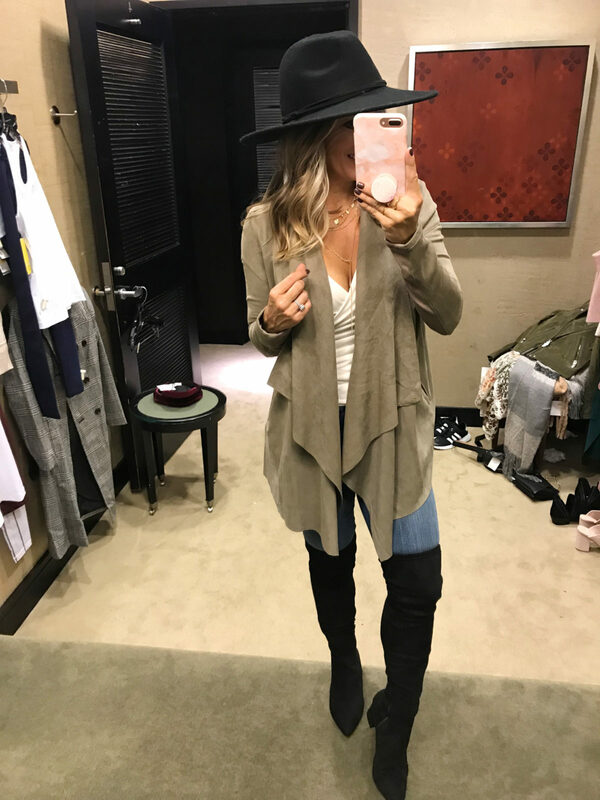 I think that chunky dusty rose cardigan is one of my favorite pieces from the sale! It looks so good on everyone I’ve seen try it AND it looks incredibly comfy. What a great way to review items from the sale! It gives such a more relatable take on what the items look like on. Thank you for your unique and helpful approach! Hello Megan, Today I received my Barefoot Dreams circle cardigan. You and James are right–so soft! I bought it then and am thanking you later! My question is about the Pacific Blue color hoping that you have seen it in person. Would you characterize it as more blue or more gray? It is sold out in my size but maybe it will be restocked before the sale is over??? Just an FYI, your bio over on IHeart Organizing needs to be updated. James is a bit older than 2 years now, I think.